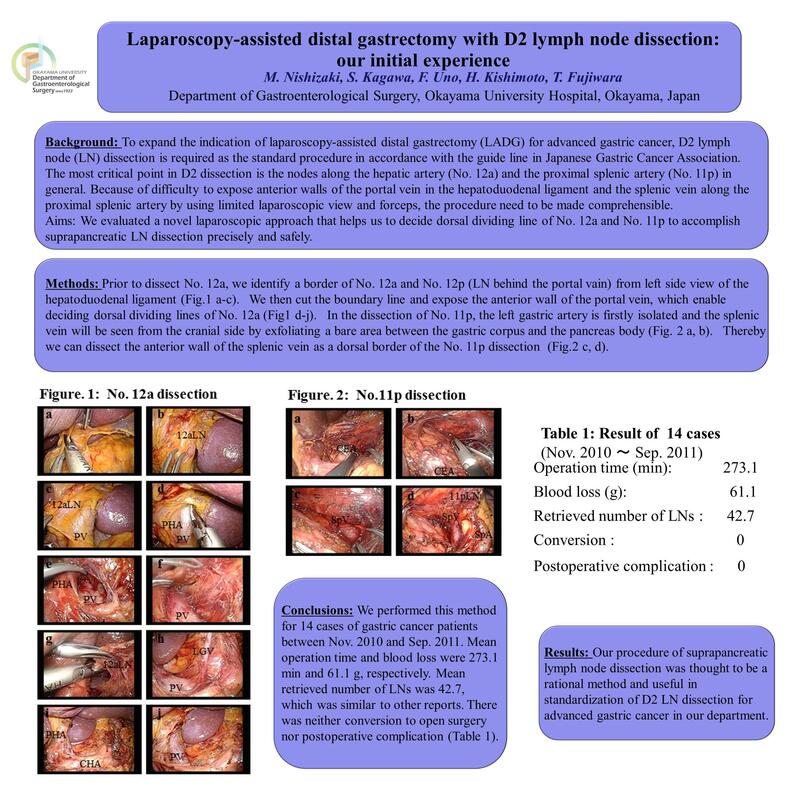 Background: To expand the indication of laparoscopy-assisted distal gastrectomy (LADG) for advanced gastric cancer, D2 lymph node (LN) dissection is required as the standard procedure in accordance with the guide line in Japanese Gastric Cancer Association. The most critical point in D2 dissection is the nodes along the hepatic artery (No. 12a) and the proximal splenic artery (No. 11p) in general. Because of difficulty to expose anterior walls of the portal vein in the hepatoduodenal ligament and the splenic vein along the proximal splenic artery by using limited laparoscopic view and forceps, the procedure need to be made comprehensible. Aims: We evaluated a novel laparoscopic approach that helps us to decide dorsal dividing line of No. 12a to p to accomplish suprapancreatic LN dissection precisely and safely. Methods: Prior to dissect No. 12a, we identify a border of No. 12a and No. 12p (LN behind the portal vain) from left side view of the hepatoduodenal ligament. We then cut the boundary line and expose the anterior wall of the portal vein, which enable deciding dorsal dividing lines of No. 12a. In the dissection of No. 11p, the left gastric artery is firstly isolated and the splenic vein will be seen from the cranial side by exfoliating a bare area between the gastric corpus and the pancreas body. Thereby we can dissect the anterior wall of the splenic vein as a dorsal border of the No. 11p dissection. Result: We performed this method for 14 cases of gastric cancer patients between Nov. 2010 and Sep. 2011. Mean operation time and blood loss were 273.1 min and 61.1 g, respectively. Mean retrieved number of LNs was 42.7, which was similar to other reports. There was neither conversion to open surgery nor postoperative complication. Conclusion: Our procedure of suprapancreatic lymph node dissection was thought to be a rational method and useful in standardization of D2 LN dissection for advanced gastric cancer in our department.